When you sign up for the project you'll have to decide how many feeders to put in your yard (0 feeders is also an option). 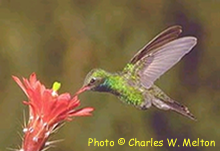 Each feeder should permit more than one hummingbird to feed from it at the same time (i.e. have multiple holes). Hang the feeders so they are at least 6 feet apart and high enough so cats can't attack the hummingbirds. Make sure you can observe all the feeders at once. Feeder maintenance: Clean your feeders between fillings, at least once a week, and every other day during the hot summer months. To do so, scrub and rinse the feeders with hot water and mild dish detergent. If mold has accumulated, soak the feeders in a diluted bleach solution (10 parts water to one part bleach). After cleaning, be sure to rinse the feeders repeatedly and thoroughly. Sugar solution: Fill the feeders with 20% sugar water (4 parts water to one part sugar). For this stage of the project, please use white table sugar only (sucrose). Do not use any commercial hummingbird food. It is convenient to boil water, than measure the amount and add it to the sugar. Let the solution cool down, or refrigerate it before filling the feeders. Food coloring harms the birds. Do not use it. Buying feeders: The Tucson Hummingbird Project has arranged for special deals when you buy feeders. At Wild Birds Unlimited, present the coupon you receive upon registration to receive a 10% discount on hummingbird feeders. Participants who buy 6 feeders will receive a 15% discount. An additional 5% discount is available when you purchase Wild Birds Unlimited Brand feeders. Participants in need of special assistance in buying feeders, please contact us.